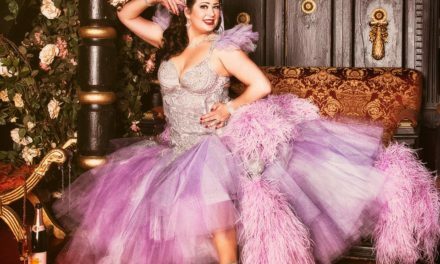 I’ve been creating burlesque costumes by customising off-the-rack pieces for approximately four years. The hot-fix rhinestone applicator was one of the first tools of the trade I discovered via the burlesque community. I must say, my relationship with this dangerous wand has been turbulent. Since discovering hot-fix rhinestones, I’ve also experimented with regular rhinestones (fixed with Gem Tack or similar crystal glue), beaded rhinestones (that is to say, flatback rhinestones with a hole in the middle) and sequins. When viewed from the distance of the auditorium, high end rhinestones and high end sequins shine to the same degree under stage lighting. My opinion is that the difference between sequins and rhinestones lies in the effect they produce (especially if you’re using 400+). Sequins tend to carry an atmosphere of old-school Hollywood, drag queens and disco-chic. If this is an effect you wish to create, sequinned fabric is an easy and cheap way to make a fully-sparkling costume (though you may get through a packet or two of sewing machine needles in the process!). Rhinestones in a colour that matches, or is a couple of shades from, the colour of the corresponding costume, add a subtle, magical twinkle. Rhinestones in a contrasting colour add texture and interest to a costume, but their contrasting colour tends to suffoctate their sparkle-effect. Of the embellishments I’ve listed above, regular rhinestones are the fastest to apply (especially if one invests in a jewellers wand to pick-up the crystals), followed by hot-fix rhinestones, with beaded rhinestones and sequins in last place. One can apply 10-12 dots of crystal glue to a garment in 30 seconds or so, and then one can place the regular rhinestones on top of these dots at a rate of about 1 rhinestone per 5 seconds (using a jeweller’s wand). Hot-fix requires that one pick up an individual crystal, wait 10 seconds for the glue to melt and then apply. Sequins/beads take about 60 seconds each when you take into account the time required for starting and finishing each stitch. Sequins/beads can take longer if you finish each sequin/bead with a smaller bead in the centre, and longer still if you start a new thread for each sequin/bead (so that if a thread breaks, it only takes one sequin/bead with it, rather than unravelling a long thread holding multiple sequins/beads). I used some of these recently as I felt that of all the options, sequins had the best chance of staying on the costume during a machine wash. After 3 trips through the washing machine (in a pillow case, washed at 30 degrees on “hand wash” setting) they had stayed stitched on to the costume, but the colour of the sequins had suffered greatly (see photograph of gold and blue sequins, before and after). I’ve found that the same discolouration occurs when sequins are positioned in places where hot, sweaty flesh rubs against the sequins – particularly near the armpits and crotch. My costume began to look tired and lack-lustre very quickly. After about 6 weeks of daily wear I replaced hundred of sequins with rhinestones. I’ve never regretted this decision. As Amber Ray once said to me ‘Sequins and fishnets are enemies’. Don’t use sequins near any areas where you intend to wear fishnet and if you’re performing near other people, beware of sequins getting hooked up in their fishnets. Sequins and fishnets are fiddly to unhook from one another and can often result in damaged fishnet or a snapped thread. The same advice applies for sequinned appliqués. So long as these are stitched on well (with a strong, nylon or polyester thread), then these will last a long time. The sequin-colour is built into the plastic, so the colour doesn’t fade. However, don’t forget to start and finish the thread with sufficient knots! As you dance and move, your costume moves with you and simple double-knots can come undone. Threads made from synthetic material are particularly prone to un-knotting. The biggest downside to these sequins is getting them hooked on to other fabrics (as above). As with semi-transparent sequins, these should last well if stitched adequately. Sadly, I’ve only ever been able to find beaded flatback rhinestones (Swarovsk) in limited colours (namely clear and AB), so they’ve not always fitted my purpose. I’ve only ever tried Swarovski. The glue is OK, sufficient for gluing the crystals to porous materials (feather fronds, cotton, satin…) but the glue doesn’t hold so well when applied to less porous materials (craft foam, feather spines…). The only success I’ve had with these is attaching them to a cotton (porous material) t-shirt. Few have fallen off and they regularly survive 40 degree easy-care machine washes. I tried to embellish a pair of faux-leather (non-porous material) shoes with these crystals and had a complete disaster. The glue didn’t hold, so I ended up using wood-glue as it was the only strong glue I had to hand. Whilst this glue was OK in the short term, as soon as I knocked the heel or sole of the shoe against a stair, a big chunk of crystals fell off. I repaired them several times, but grew so disheartened that I eventually gave up and left all the crystals to fall off. 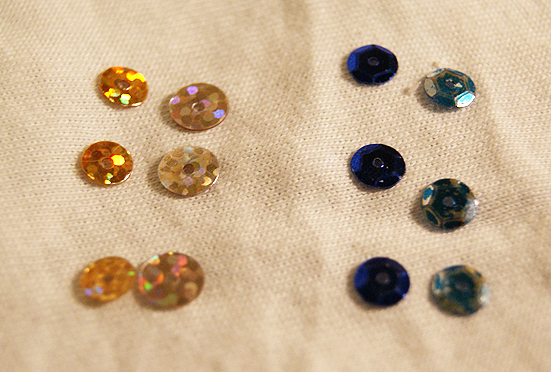 When using non hot-fix rhinestones, I pair them with Gem-Tack adhesive. I’ve found this glue incredibly strong, bonding the crystals really well to man-made fabrics (usually non-porous), faux-suede (porous) and other materials. The Gem-Tack bottle advises that 24 hours after application the glue will be set suficiently to survive washing, but not dry cleaning. With this in mind, I put my embellished poly-satin costume in a pillow case and washed it in the mashine on “hand wash” setting, at 30 degrees. Upon taking the costume out of the bag, ¾ of the rhinestones had fallen off! It was gut-wrenching. I’ve not attempted washing the costume since, but of course, when I do, it will be in the sink and cold. I’ve yet to put any other Gem-Tack fixed crystals through the washing machine, so I’m not sure if the rhinestones falling off was the fault of the glue, or the pairing of Gem Tack and poly-satin. I’m going to sideline sequins and beads in this section, and focus on rhinestones. I’ve tried Swarovski, Preciosa and un-branded rhinestones. Un-branded rhinestones are my least favourite. The glass (or plastic!) tends to be slightly cloudy and cut with few facets. This results in a rhinestone that works as a contrasting texture within a costume, but doesn’t add much (if any) magical sparkle. Swarovski are, of course, the king of rhinestones, but come at a high price! 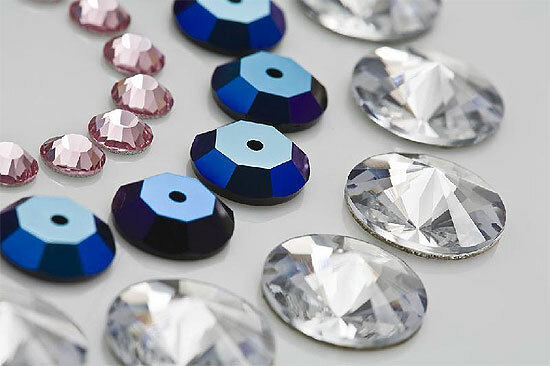 The choice of shapes, colours and sizes is huge and one can rely upon Swarovski to make exactly the kind of crystal one’s looking for. Preciosa is my favourite brand of rhinestone. Some people say that they have a little less sparkle than Swarovski, but in my opinion, this belief comes from Swarovski’s reputation rather than a like-for-like comparison. Preciosa crystals come in the same colours and sizes as Swarovski, but cost a little less. So – what’s best for your costume? Now you have the benefits of my experience, it’s up to you to decide! Personally, if I know my costume is going to be used under big stage lights, I ensure it has a touch of subtle sparkle. I prefer to use non-hot-fix Preciosa rhinestones for this purpose. If I know my costume is likely to only ever be used on small cabaret stages, I use textures and the occasional hint of sparkle (probably with use of sequinned appliqués) to add depth to my costume. For me, there’s no point in spending lots of money on high-shine, expensive rhinestones if there’s no light available to make them sparkle! NextNaked Girls Reading: Anniversary Special!